Karnataka PGCET 2019: Karnataka Post Graduate Common Entrance Test (Karnataka PGCET) is a state-level entrance exam to get admission in M.Tech/MCA/M.E./MBA and lateral entry to 2nd year MCA. Karnataka PGCET is conducted every year by Karnataka Examination Authority (KEA). 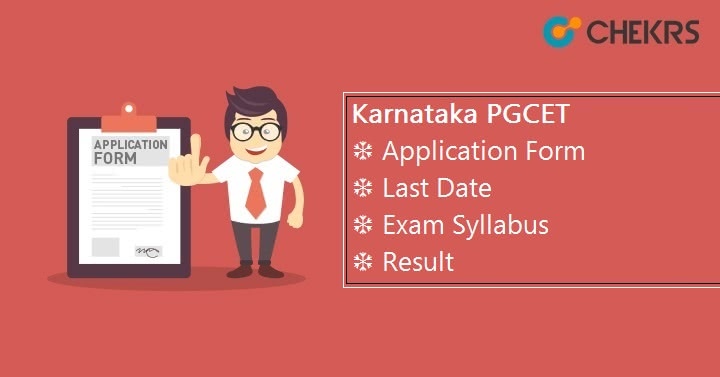 Karnataka PGCET 2019 Application Form will be available online from May 2019. Eligible Candidate can fill the application form and appear for Karnataka PGCET 2019 Exam. Applicants who successfully clear the exam will get admission in any of 178 colleges or institutes across the Karnataka state. Karnataka PGCET 2019 Exam Dates are not announced yet. We will update you shortly after getting the notifications from the official portal. Here we are providing the tentative schedules of Karnataka PGCET. These are expecting dates, so it may change after the official notification. Candidates are advised to make sure about the Karnataka PGCET 2019 Eligibility Criteria before applying for the application form. It is necessary to satisfy all criteria defined by the examination authority of KEA. Below are some rules/criteria, please check it. Must have Bachelor’s degree of minimum of 3-years duration/equivalent exam from the recognized university. Candidate must have passed with minimum 50% marks (45% for SC/ST/Category-I of Karnataka state). For more details related to eligibility criteria, check the portal keaF.kar.nic.in. Karnataka Examination Authority (KEA) will announce the starting date of filling of KEA PGCET 2019 application form in the month of May, 2019. The application form will be available through online mode. Interested candidates can fill the Karnataka PGCET Admission Form on or before the last submission date of form. Before filling the application form, it is required to meet the eligibility criteria described by the authority of Karnataka Examination. Gate qualified students can also apply, but they have to submit the filled application form. Visit the official portal kea.kar.nic.in and click on the “New User? Click Here to Register”. Candidates have to register themselves with their personal details. A unique id or number will be generated after the completion of the registration process. Next, fill the application form with the details it required. Gate appeared candidates have to give details related to their GATE exam. Payment can be done by either online or offline mode. Karnataka PGCET Syllabus will be different for each course. The detailed syllabus of each course is available on the official website. Visit the portal to download the syllabus according to your course. Karnataka Examination Authority will decide Karnataka PGCET 2019 Exam Pattern. Exam pattern guides candidate about the difficulty level of the question, number of question asked in the exam, mode of paper etc. Given below is the KEA PGCET 2019 exam pattern, go through it. The Paper will be conducted through offline mode (pen-paper). Total marks will be 100. For each correct answer, 1 marks will be allocated. Total time will be 2 hours and 30 minutes. Paper will be comprised of Multiple Choice Questions. Karnataka PGCET Admit Card will be available from 3rd week of June 2019. The authority will release the admit card through online mode so, visit the portal www.kea.kar.nic.in and download the KEA PGCET 2019 Hall Ticket. Take the print-out of admit card. Bring the admit card while appearing for the PGCET Exam. Without admit card no one will be allowed to enter in exam hall. Karnataka PGCET 2019 Answer key will be published after conducting the Karnataka PGCET examination successfully. Karnataka PGCET Answer key will be released online. Appeared candidates can check the answer key and can match with their answer. If there will be any issue, students can claim it. The DTE, Karnataka will release the answer key in the month of July 2019 on their official portal. The official authority will declare the Karnataka PGCET 2019 cutoff on the portal of Karnataka Examination Authority. Candidates have to score minimum marks to get admission in colleges across Karnataka state. KCET cutoff will be released separately for various courses like M.Tech/MBA/MCA/M.E. and lateral entry in MCA. The Karnataka Examination Authority (KEA) will declare probably in August 2019 on the official site www.kea.kar.nic.in. PGCET 2019 Result can be downloaded from the site. Students will get admission on the basis of their scorecard published by the examination authority. The KCET result will release in the form of a rank list. Merit list will upload separately after declaring the Karnataka PGCET result. Karnataka PGCET 2019 Counselling will be released through online mode by the KEA authority. Candidates who scored the cutoff marks will be invited for KCET Seat Allotment process with counselling letter. Applicants have to report at the venue written on the counselling letter. The Authority will upload the list of candidates selected under the reserved category seat on their website.